The Russian poker player Dmitry Yurasov is a very happy man. 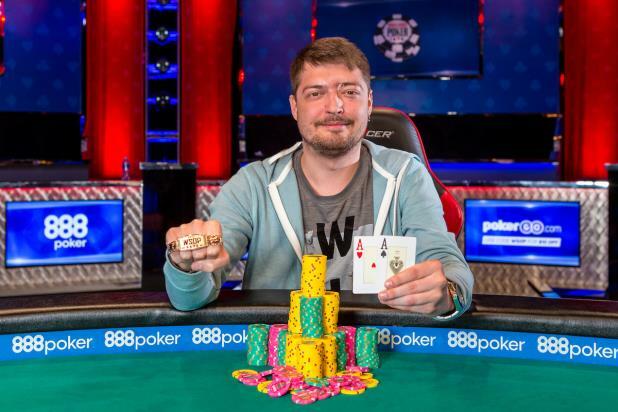 He has earned the first gold bracelet of his career after winning the 2017 World Series of Poker $10,000 Six-Max No-Limit Hold’em Championship. He is a professional poker player who has found his bearings in the live tournaments held in Europe and Asia. Dmitry has over $1.2 million in earnings. But, he did not have any cash wins at the WSOP series. This vacuum in his poker portfolio was filled on June 24th, 2017 when he won the $10,000 Six-Max No-Limit Hold’em Championship blasting out 332 players taking part in the event. He took home the top prize of $775,923 and through this; he earned his first cash from a WSOP event. Now, he is richer by over $2 million live earnings. Yurasov entered the final day of the championship in the 5th position and there were 24 players remaining in that last day. Some of the top players that he accounted for on his way to claiming his first gold bracelet were twice bracelet winner Kristen Bicknell, WSOP bracelet winner Sam Stein, Grayson Ramage, Charlie Carrell, Connor Drinian and Eric Wasserson. The fight for the top place was clearly evident in the final table. Yurasov was in top form at the final table and quickly knocked down Albert Daher, ArtemMetalidi and Jacob Powers, who finished in 5th, 4th and 3rd place respectively. He set up a heads-up final clash with Tommy Chen. Yurasov started the heads-up with 5-to-1 chip advantage and did not look back at all. Yurasov said that he played plenty of expensive tournaments for some time. But, winning the gold bracelet for the very first time in his career has made this achievement feel very special to him. He was able to show his best at the WSOP event now.